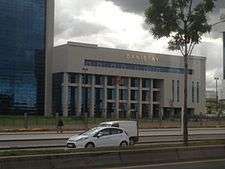 The Turkish Council of State (Turkish: Danıştay) is the highest administrative court in the Republic of Turkey and is based in Ankara. Its role and tasks are prescribed by the Constitution of Turkey within the articles on the supreme courts. "The Council of State is the last instance for reviewing decisions and judgements given by administrative courts and which are not referred by law to other administrative courts. It shall also be the first and last instance for dealing with specific cases prescribed by law. The Council of State shall try administrative cases, give its opinion within two months of time on draft legislation, the conditions and the contracts under which concessions are granted concerning public services which are submitted by the Prime Minister and the Council of Ministers, examine draft regulations, settle administrative disputes and discharge other duties as prescribed by law. Three-fourths of the members of the Council of State shall be appointed by the Supreme Council of Judges and Public Prosecutors from among the first category administrative judges and public prosecutors, or those considered to be of this profession; and the remaining quarter by the President of the Republic from among officials meeting the requirements designated by law." Currently within the Turkish Council of State there are 15 Divisions, 14 of them are judicial divisions and one of them is consultative division. In each division, there are at least 5 members including the Head of the Division. Judgments are delivered by an absolute majority. The Plenary Assembly of the Council of State consists of 156 members, (president, advocate general, vise presidents, head of the divisions and members). The president of the council is Zerrin Güngör.